Short update on heavyarms.I didn't really do much these 2 weeks,started a little on the diorama,did some pla plating and thats about it.I've been looking around for a new compressor,hopefully i'll get it sometime soon and speed up the progress. Here are some photos of some parts with pla plates added.i will continue doing next week and start on adding rivets and panel lines. For mods,i have only extended the feet attachment to match the scale of the rest of the parts. Ok,i think thats about everything. After a 2 months break,i finally back...It seems like every time i finish a project,i'll fall into a slump.But i feel that those breaks make gunpla enjoyable for me again,thus i am able to work faster and enjoy myself at the same time. I probably became rusty after the break because the first thing i did was to cut up a wrong part.Luckily,I was able to salvage it,or else i might have to buy another set of full armor unicorn!I hope the project will be smooth sailing after this. 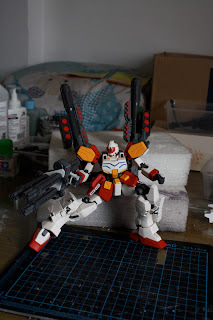 There are 3 modification i'm doing right now.Firstly there is this "tri-gatling gun" i'm making,nothing special just combining the gatling guns from unicorn to match the OVA version of Gundam heavyarms. Secondly,i modified the unicorn back pack attachment to fit the back of heavyarms.A simple 2 pin mod,but it took me quit some time because of the mishap i mentioned just now. Lastly,the biggest hurdle that i think for this project,scratch building the feet attachments.For now i'm just building the base of it,and will add details when this is done.I'm actually quite worried about this,but i still have to give it a try. For the diorama,i've thought of making a mountain slope.Since i got some experience of making mountainous terrain from making the diorama for epyon.Unfortunately,it failed but it was still good experience. I think thats it for this week,next week i'll be continuing the feet attachments and gatling gun mod.Also i will start making the diorama so please stay tune.Cheers! How to scribe nice and clear panel lines for your gundam models.